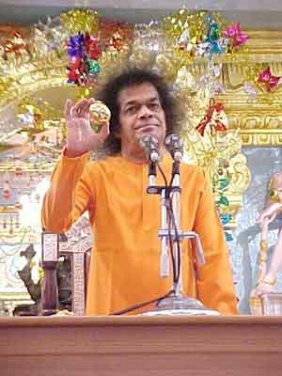 Sai Baba during Maha Sivarathri celebrations in 2002 (source of photograph: International Sathya Sai Baba Organization, www.sathyasai.org). Puttaparthi (Andhra Pradesh), Nov 23 (IANS) — Thousands of devotees from different parts of the country and abroad had lined up outside Prashanti Nilayam in Puttaparthi from Wednesday night to seek Sai Baba’s blessings. However, a stampede and police using force to control the crowd marred the celebrations. A few people were injured when police caned the crowd, getting impatient at the delay in getting a glimpse of the famous guru. People were also disappointed that VIPs were being given preference in getting a ‘darshan’. Amongst the dignitaries at hand were Andhra Pradesh Governor Rameshwar Thakur, Maharashtra Chief Minister Vilasrao Deshmukh, Karnataka Governor T.N. Chaturvedi and several state ministers. President Kalam, who had arrived in Puttaparthi on Wednesday, called on Sai Baba at his abode. He lauded the social service rendered by various organisations run by Sathya Sai Trust. The president had Wednesday evening inaugurated the Sri Sathya Sai International Centre for Sports Indoor Stadium built at a cost of Rs.200 million and participated in the silver jubilee convocation of the Sathya Sai Deemed University. He spent the night at Prashanti Nilayam and returned to New Delhi after attending the birthday celebrations. Sai Baba, who claims to be a reincarnation of a Hindu god, preaches love, understanding and universal brotherhood. In the last few decades, he has built a vast empire worth billions — transforming the small village of Puttaparthi, his birthplace, into a modern town with a state of the art airport and the best of education and health facilities. Sai Baba, who was born on Nov 23, 1926, had declared at 15 years that he was no ordinary human being but had come to earth to fulfil the wishes of the saints and sages. His original name was Sathyanarayana, which was later changed to Sathya Sai Baba. He used to perform miracles like producing gold out of thin air, but stopped about a decade ago after a controversy when rationalists challenged him to perform the miracles in their presence and accused him of cheating people. The trust and various organisations formed by him have a presence in 160 countries. His devotees include heads of states, eminent politicians, army generals, judges, filmstars and sportspersons.